Our Toronto Refrigeration technicians will provide the basic advanced preventative maintenance for your Stove Repair. We will perform the repair service in your home for your commercial or residential stoves. 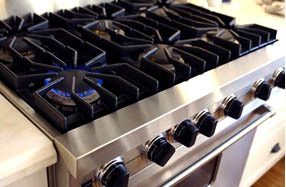 Toronto Refrigeration has the most highly qualified Stove repair technicians that will be able to provide the most efficient service following an appointment. For more information please call Stove Repair Toronto by Toronto Refrigeration. When your oven/ stove does not heat up, check the electrical elements and wiring. Faulty wiring should not be handled on your own and requires professional service that we would be delighted to provide. Our qualified technicians will be provided on call to figure out the solution. If you find that your stove top elements are not functioning, you may think you have to change the machines elements. However, that may not even be necessary. It most likely could be something as simple as wiring, faulty connectors and faulty switch. These problems are the utmost easy and simple defects to resolve for our Stove Repair Toronto technicians. Self cleaning function not working? Typically, a faulty latch on the door prevents the self cleaning function from operating. In some cases the problem could be a broken element or on unique occasions, a defective control board. Our experienced Stove Repair Toronto technicians will be glad to provide their service and answer any of your questions/concerns regarding a broken stove. If you find that your stove elements will not turn off, the problem is usually related to internal wiring, the infinity switch or on rare occasions the control board. Our trained technicians will do a series of tested to solve and repair your stove. F1 and other error codes? F1 error code could be something as common as loose wiring, in rare cases you may need to change the control board. The control board is expensive but it is more cost efficient in replacing then buying an entire new stove. Our stove technicians will thoroughly diagnose and explain each of the error code before they repair the problem.